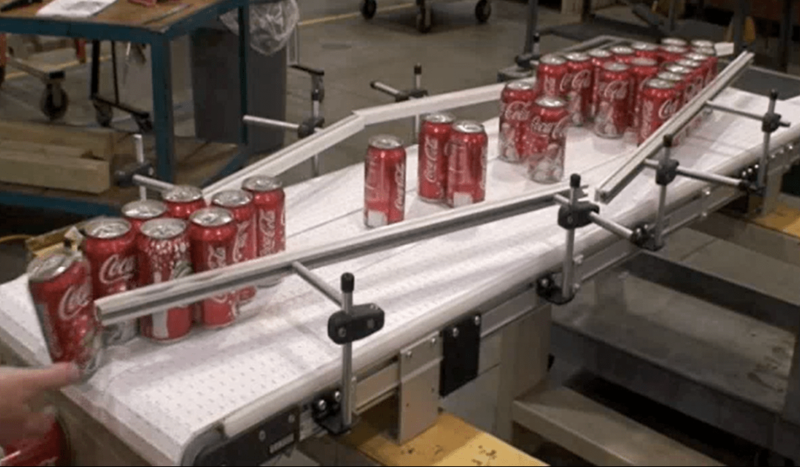 On a recent project, we created a recirculating table made by placing two conveyors side-by-side, with their belts moving in opposite directions, and adding guiding to help the product transfer from one conveyor to the next. This video shows rectangular packages being recirculated at about 40 ft/min. Trays are conveyed to the recirculating table, which acts as a buffering zone to allow time for operators to pick finished product and manually case pack. Recirculating tables are used often in applications where parts or products are continually being fed into an accumulation area in order to keep a steady product flow. This can be particularly useful when handling delicate product by minimizing back pressure on the conveyor and thus reducing product loss and/or damaged product.